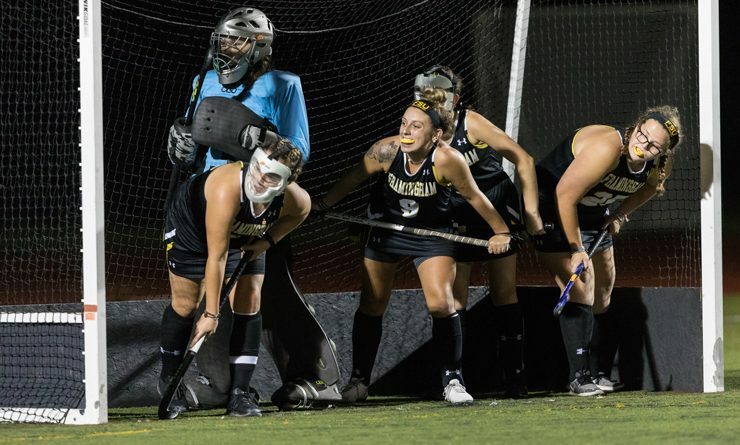 FRAMINGHAM – The Framingham State University field hockey team closed the 2018 season with a 3-0 loss at home to Eastern Connecticut State University in Little East Conference (LEC) action Friday evening at Elliot Field. Framingham State finished the season at 1-11 in the Conference and 3-14 overall. Eastern Connecticut finishes its season at 5-9 overall. The Warriors got on the board first in the 16th minute as junior Morgan Sanson converted an unassisted marker. Just over five minutes later, the Warriors doubled their lead as Sanson assisted on a tally from freshman Sydney Collentine. The Warriors would add a final goal in the 49th minute as senior Erin Sheehan assisted on a tally from junior Lindsey McKeon. Eastern Connecticut outshot the Rams 14-8 in the contest and held a 7-4 edge in penalty corners. Senior Haley Duggan, a Framingham High product, took the loss for the Rams in the cage. Duggan made seven saves in her final collegiate action. Sophomore Keira Integlia earned the victory in net going 61 minutes and making four saves before giving way to freshman Abby Harris who did not record a save in her nine minutes of action. The Rams season came to a close this evening and prior to the game their three seniors – Meaghann Ackerman, Haley Duggan, and Bailey Donelly – were recognized as part of Senior Night. Donelly and Duggan both played field hockey at Framingham High.